Solid dividend-growth stocks serve as great additions for a diversified portfolio. Ones with safe yields of 4-6% tend to be good stabilizers for the portfolio. Buying these stocks in market corrections would be even better; you’d be capturing a bigger yield for more value for your loonie! Royal Bank (TSX:RY)(NYSE:RY) and TransCanada (TSX:TRP)(NYSE:TRP) are proven dividend-growth stocks that should be at the top of your buy list in a market correction. 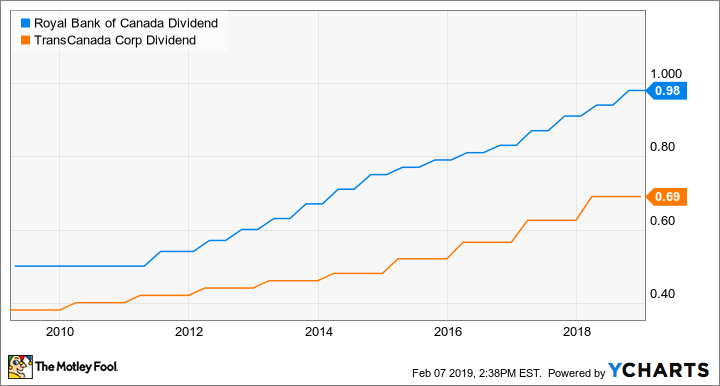 RY Dividend data by YCharts. The 10-year dividend history of Royal Bank and TransCanada. Solid dividend-growth stocks serve as great additions for a diversified portfolio. Ones with safe yields of 4-6% tend to be good stabilizers for the portfolio. Buying these stocks in market corrections would be even better; you’d be capturing a bigger yield for more value for your loonie! Royal Bank (TSX:RY)(NYSE:RY) and TransCanada (TSX:TRP)(NYSE:TRP) are proven dividend-growth stocks that should be at the top of your buy list in a market correction. Royal Bank is a leader across a broad range of financial services in Canada. It also aims to be the preferred partner to corporate, institutional and high-net-worth clients and their businesses in the United States. At the end of fiscal 2018, Royal Bank had assets of about $1,324 billion, loans of $570 billion, and deposits of $833 billion. For the full year, its net income was a record high of $12.1 billion — $8.36 on a per-share basis. The banking leader only paid out about 46% as dividends. So, there is a lot of buffer for once-in-a-blue-moon events such as the Great Recession in 2008-2009, which was triggered by a financial crisis. From fiscal 2007 to 2018, Royal Bank more than doubled its dividend per share. On an annualized basis, that’s a growth rate of 6.84%, which is more than double the inflation in that period. Currently, at about $101 and change per share as of writing, Royal Bank is good for a nearly 3.8% yield. It’s reasonably valued at a price-to-earnings ratio of about 11.8. In a market correction, investors can push for a starting yield of closer to 4.5%. TransCanada maintains a diversified portfolio of energy infrastructure assets, including nearly 92,000 km of natural gas pipelines and more than 650 billion cubic feet of natural gas storage, about 4,900 km of oil and liquids pipeline, and about 6,100 MW of capacity to power more than six million homes. At the end of September, TransCanada had more than $94 billion of assets. In the last four reported quarters, it generated net income of more than $3.4 billion. Notably, the nature of its business has lots of non-cash expenses, which reduces the net income. So, looking at the company’s cash flow generation gives a better picture of the company’s health. TransCanada generates largely regulated or long-term contracted cash flows, which calls for a safe dividend given the company maintains a sustainable payout ratio. In the first nine months of 2018, TransCanada reported generating comparable distributable cash flow of more than $4.1 billion, a growth of 12.6% compared to the same period in 2017. On a per-share basis, it was nearly a 9.2% increase. This implies a payout ratio of about 45%. In the last decade or so, TransCanada more than doubled its dividend per share. On an annualized basis, that’s a growth rate of 6.65%, which is more than double the inflation in that period. Management is confident about the prospects of the company and expects to increase the dividend per share by 8-10% per year through 2021. Currently, at under $56 per share as of writing, TransCanada is good for a nearly 5% yield. But wait! According to its usual schedule, it’s set to raise its dividend very soon within the quarter. This would imply a forward yield of at least 5.3%. Investors should take market corrections as opportunities to buy proven dividend-growth stocks, such as Royal Bank and TransCanada, which offer safe, juicy yields.